You can win the Protected by Veeam photo contest at VMworld! Be sure to stop by the Veeam booth (813) at VMworld in Las Vegas. There you can get and exclusive sneak peek of Veeam Backup & Replication v6. (See last week’s post on what to expect from Veeam at VMworld). 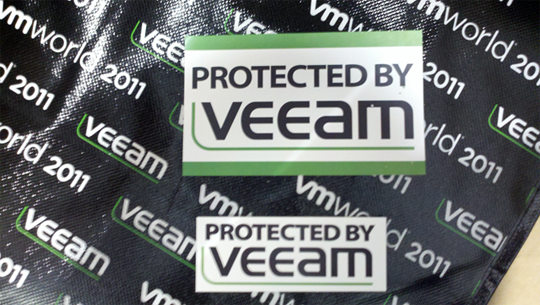 One increasingly popular item to look out for are the new “Protected by Veeam” laptop and server rack stickers. We’re having fun with the stickers and we want you to do the same, so we’re announcing a contest! Pick up a sticker, place it somewhere and take a picture. The Veeam staff favorites will win. We will select six winners for $60 Amazon gift cards next week based on pictures shared via Twitter. Be sure to use the #Veeam hash tag and we’ll be sure to notice it and re-Tweet the picture!